Well today we elect the president of the United States. Wait! you say, did we not just do that a few weeks ago? In the run up to the election, I and others saw the possibility that this election could result in a gap between the national popular vote and the electoral college vote. And people think that unfair. Consequently I decided to start working on a series of graphics to help explain the system. But before I could finish, the Washington Post published this piece that I think does a strong job. So, I am going to point you there instead. The United States is not a democracy, but a federal, democratic republic. Though that may smack of wordsmithery, it is an important distinction. We are a democratic republic in that we elect people to represent us, we do not directly vote on matters of government. And then that federal bit. The United States was formed by sovereign states, i.e. the colonies and other independent republics like Texas and (sort of) California. Others were territories belong to sovereign states that we acquired through negotiation, e.g. the Louisiana territory and Florida. In short, the United States is not a unitary state ruled by an all-powerful central government. The central government only has the authority granted to it by the states and territories entering the union. The electoral college of 538 members comes from each state’s House delegation and its two senators. And because this is a federal, i.e. state-led, republic, each state determines how to divvy up their votes. Most states do winner-take-all. Two, Maine and Nebraska, allocate them based on who wins the House districts and then an additional two (from the number of senators) to the overall state winner. That very complicated system was designed to ensure that states with smaller populations are not summarily outvoted and overruled by the largest of states. This initially helped the smaller states in the Northeast like Maine, Rhode Island, Connecticut, and Delaware, but also the slave states like Georgia. In 2016, this means that the states of the Great Plains and Rocky Mountains receive overrepresentation at the expense of the larger states like California, Texas, New York, and even my Pennsylvania. 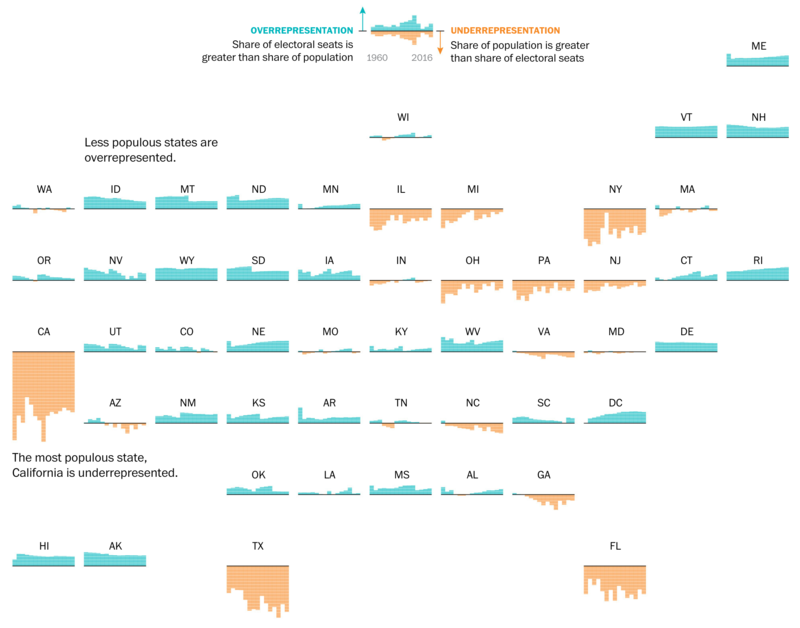 The graphics from the Washington Post do a great job of showing not just how states today are over- or under-represented, but how that has changed since 1960. That is an important date given the Voting Rights Act that attempted to break down systemic injustices against minorities, particular blacks, in elections. This small multiple map of the United States shows representation changes over time. Really well done. Is the electoral college “fair”? If this was a unitary republic, no. I doubt anyone would or could argue that point. But the United States is not and was not meant to be a unitary republic. We are a collection of sovereign states that grant power to a federal government. So in that sense, the electoral college is a fair, albeit not perfect, system that seeks to reallocate electoral power from high population states to low population states. Credit for the piece goes to Denise Lu.